Two-round general elections are planned, but I don’t have an ETA. No plans to introduce run-offs for primaries yet. My copy crashes on startup. It started up the first time, now won’t start up without crashing. I did start working on customizing a scenario, if that might have caused it (nothing else seems possible). Do you get an error message? Where exactly does it crash? What is your operating system? It crashes as soon as I open it, with the standard Windows crash message “pi.exe has stopped working.” My OS is Windows 10. By open it, do you mean the game or a campaign? Also, what happens if you right-click on the game icon and select Run as Administrator? I mean opening the game, and I just tried “run as administrator”– same thing. It happens right after the screen with the logo. Without any other reports of this, my guess is something happened to damage the exe. Please try uninstalling and reinstalling the program. I will uninstall and reinstall. It still doesn’t work, but the uninstall/reinstall process gives me an idea why it doesn’t: I had to reboot to start the process because apparently the computer sees the process from my first use as still running. It wouldn’t install, saying it needed access to files in use by PI.exe, despite that task manager doesn’t show the program running. I’d recommend opening up cmd (with admin rights) and typing “taskkill /f /im pi.exe” and see if anything is found. Are you saying you rebooted and you still can’t install? Primary popular vote soon please! I have my PA 2018 Gubernatorial and Senatorial I was working on (and trying to make it official for you to release) and now there all but broken,I focused alot of times on primaries,please my man! I was able to uninstall/reinstall after reboot, but still get the same error. I’m curious as to why it’s so hard to win this scenario as Scott, given the actual polling on this race. In the new update, Nelson wins the race on simulation by an average of double digits, even with 20 simulations (55.9% to 44.1% to be exact on easy, 55.3% to 44.7% on hard). That seems off. Are you using a program like McAfee or Norton that might be interfering with a program running? No plans right now for PR in the general election. It will probably happen if an official campaign is made that uses it. It sounds like either the save file is getting too big, or there is a memory problem elsewhere that is causing problems with saving. This is a known problem with certain systems. Workaround: save the game every month or so, then close the app, restart, and load. So, I just purchased the game on Thursday. 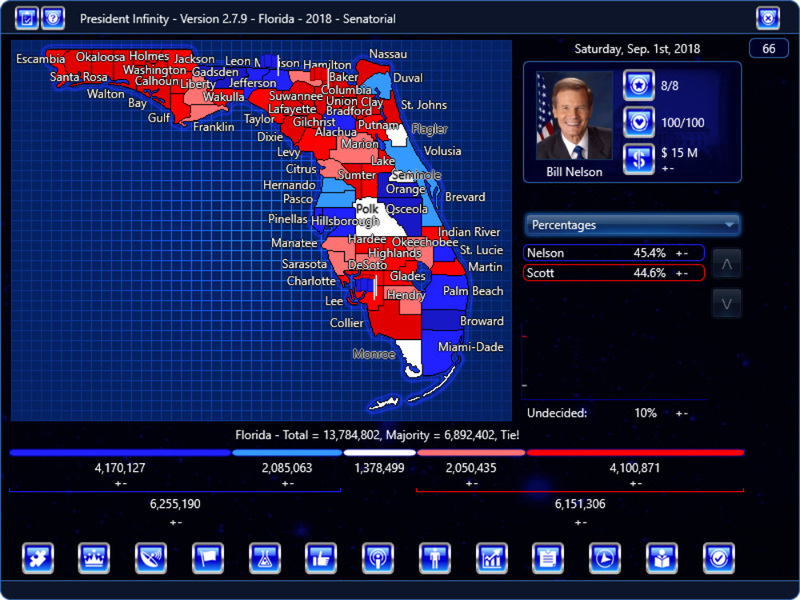 Playing President infinity 2.8.2. It continues to freeze on me. The turns were processing extremely slowly and then in the middle of a turn it just stopped. (Was playing a primary and only got about 7 or 8 turns in) This is the second time in two days this has happened. What is going on? Do you run into these problems if playing from the general election (not starting in primaries)? Hey just wanted to update. It only happened with primaries, it happened 2-3 times, but it hasn’t happened since. I’m not sure what changed, but it seems to have resolved itself.